At this year's MIDO trade fair in Milan, l.a.Eyeworks received plenty of love from the press! 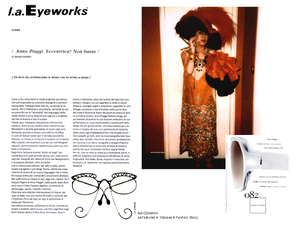 The highlights can be seen in the 'l.a.Eyeworks Gets Exposed' photo album, along with an archive of recent news. The image above comes from the Italian optical journal Glasses & Fashion. Editors there asked what frame could possibly suit the legendary style icon Anna Piaggi. The answer? l.a.Eyeworks, naturalmente! (The frame, Magda Man, is a vintage l.a.Eyeworks couture creation).